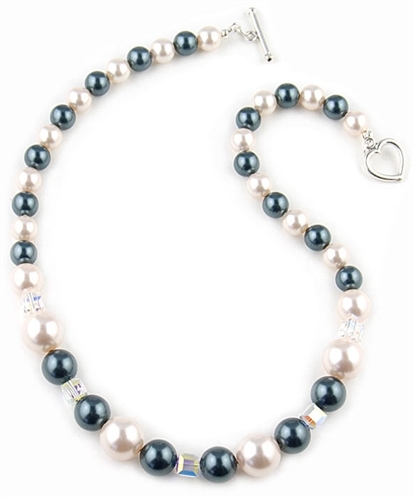 Pearl necklace with Swarovski Pearls & Crystals by Farfallina. This striking necklace features 8-12mm graduated Cream and Tahitian Swarovski pearls and five 6mm AB Swarovski crystal cubes in the front. Necklace measures 16.8" in length and has a 14mm Sterling silver heart toggle. Perfect for the Bride to be and also makes an elegant gift.